The Cathedral was only completed in 1978. 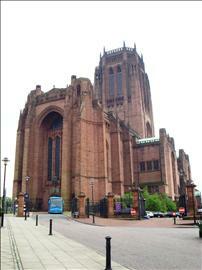 It was designed by Sir Giles Gilbert Scott when he was only 22 years old. It is a great space, without pillars or pews, the space is able to host huge concerts, exhibitions and fine dining on the main floor. The tower is 110m high and is the best view in the city. The nearest National Rail station is Lime Street. There are 10 designated parking bay(s) within the car park. The dimensions of the designated parking bay(s) are 360cm x 245cm (11ft 10in x 8ft 0in). The nearest designated bay is 3m (9ft 10in) from the main accessible entrance. Lift access to the Cathedral is next to the designated parking. You are on Outside Access (Car Park - Accessible Entrance). Skip to the next section. You are on Level Change (Car Park - Accessible Entrance). Skip to the next section. The width of the ramp or slope is 95cm (3ft 1in). The door is usually held open during opening hours. You are on Outside Access (Cathedral Gate - Main Entrance). Skip to the next section. The doors open by sliding. The door opening is 200cm (6ft 7in) wide. You are on Level Change (Cathedral Gate - Main Entrance). Skip to the next section. There are a further 8 steps inside the main entrance with handrails on both sides. You are on Reception (Welcome Desk). Skip to the next section. There are 6 medium steps, with a handrail on the left, for access to the Eduaction Centre. A platform lift overcomes this level change. A portable ramp is available for access to raised areas. You are on Restaurant Bar Internal (Mezzanine Café). Skip to the next section. The type of food served here is hot and cold snacks and beverages. Level access to the café is via the Gift Shop platform lift. Designated seating is located the front of the auditorium. Companions sit adjacent to the patron. The hearing system is a fixed loop. The floors which are accessible by stairs are G-M. These stairs give access to the Mezzanine Café. Alternative access is via the Gift Shop lift. The floors which are accessible by stairs are B-2. These stairs are located in the Welfare Block. You are on Lift (Welfare Block). Skip to the next section. The lift is located in the Welfare Block. The floors which are accessible by this lift are B-2. The lift is 45m (49yd) from accessible entrance. The dimensions of the lift are 104cm x 138cm (3ft 5in x 4ft 6in). The lift is located immediately beyond the accessible entrance. The floors which are accessible by this lift are LG - G.
The lift is 3m (9ft 10in) from accessible entrance. This lift gives access to the cathedral from the accessible entrance. There is a phone available to access help with the doors. The lift is located in the Ambulatory. The dimensions of the lift are 90cm x 120cm (2ft 11in x 3ft 11in). This lift gives access to the Education Centre in the Ambulatory. You are on Lift (Gift Shop). Skip to the next section. The lift is located in the Gift Shop. The floors which are accessible by this lift are G-M. The lift is 60m (66yd) from accessible entrance. The dimensions of the lift are 80cm x 148cm (2ft 7in x 4ft 10in). This lift gives level access to the Mezzanine Café. This accessible toilet is approximately 45m (49yd 8in) from the accessible entrance. This accessible toilet is located in the Welfare Block. The dimensions of the accessible toilet are 140cm x 190cm (4ft 7in x 6ft 3in). Wall mounted and drop down rails are not available. The female toilets are located in the Welfare Block. The female toilets are 48m (52yd) from the accessible entrance. The male toilets are located in the Welfare Block. The male toilets are 48m (52yd) from the accessible entrance. An audio tour is available. Large print scripts for the audio tour can be provided on request. The photograph shows 1 of the Education Stations that the Cathedral now provides. Staff are trained to take TypeTalk calls.